The Prasada, located at 50 Central Park West, was designed in 1907 by Charles W. Romeyn and Henry R. Wynne. In the intervening years, many renovations had altered the form of the building’s apartments. Most of the walls in this turn-of-the-century apartment with a typical Victorian plan had previously been removed, creating an amorphous, loft-like space. The design team wanted to bring back the sense of formal entrance and procession typical of that era without rebuilding the apartment in its old form. 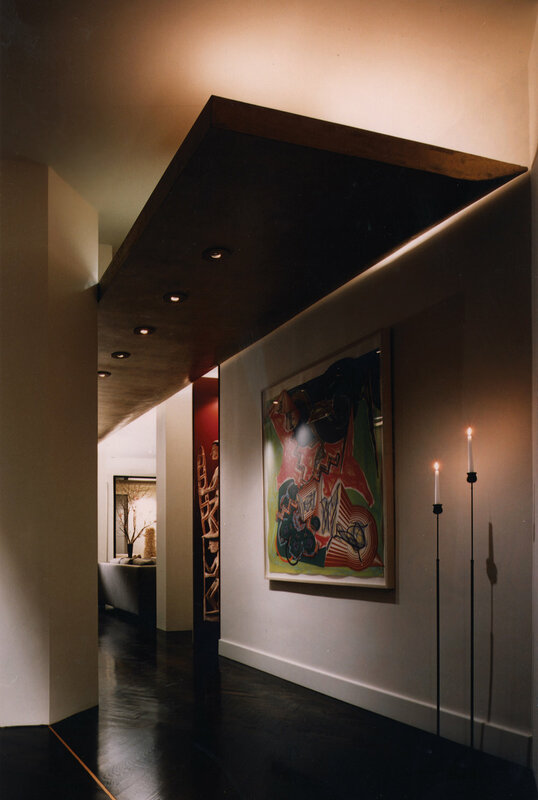 To do so PKSB created an elliptical foyer to provide a sense of entry and reestablish the hall by means of a series of structural columns, stripped to the bone, and a 35-foot long suspended metallic canopy with lights washing the ceiling and spotlighting the ebony-stained wood floor. The redesign is spacious enough to give the owner’s collection of recent American art room to breathe. A diverse collection, that includes works by Ad Reinhardt, Frank Stella and Willem de Kooning, the artwork required several different setting for display. The canopy defines the gallery’s boundaries and length. Geometric details - tight rows of lights, unadorned windows, a black lacquered door frame, and pocket doors between the dining area and the den - create an overarching setting and bring order to the apartment as a whole. The finished apartment provides not only a home for its owners, but also an environment for their art collection.